I can no longer bowl three games straight. 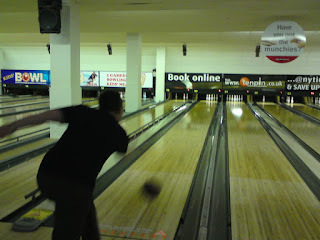 My scores get progressively lower, until in the third game my arm gives out and I am lucky to get out of the gutter! Anything/everything is more fun than watching any drama show on television - unless it is a comedy show! I totally understand why people have their personal bowling balls made. Towards the end, my fingers were cramping and swollen and I could no longer find a ball with the right size holes for my fingers! Am I allowed to chuckle in all the wrong places?